The second hilarious and heartwarming illustrated chapter book from the writer of the blockbuster film Minions! Grumbolt is majoring in action! 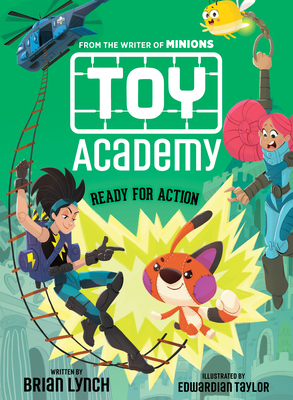 He's finally getting to follow his dreams at Toy Academy, from learning daring maneuvers, to getting paired up with a sidekick! Grumbolt can't wait to find out who his sidekick is... until it turns out that he's the sidekick. And to school bully Rex Everything, no less. This duo will never work. But when a toy named Tempest Boomcloud kidnaps a classmate and steals Rex's van, it looks like Grumbolt and Rex will have to work together to stop Tempest's evildoing and figure out why she's terrorizing them. Can they stop fighting long enough to brave dangerous lairs, vanquish terrifying teddy bears, and stop Tempest? This laugh-out-loud chapter book by Brian Lynch, the writer of Minions and a writer of The Secret Life of Pets, and illustrated by Edwardian Taylor, is stuffed full of action and fun. Brian Lynch is a screenwriter whose work includes the movies The Secret Life of Pets, Minions, Puss in Boots, and Hop. He has also written the comic books Monster Motors, Bill & Ted's Most Triumphant Return, Spike, and Angel: After the Fall. He currently lives in Los Angeles with his wife and son. He firmly believes that the greatest toy is either an Adventure People Daredevil Skydiver or Shipwreck from G.I. Joe. Edwardian Taylor works as a freelance visual development artist for mobile games, TV, films, and commercials in Dallas, Texas. He is the illustrator of the Toy Academy series, written by Brian Lynch, as well as the illustrator of the picture books Race!, written by Sue Douglass Fliess, and It's Not Jack and the Beanstalk, written by Josh Funk. Learn more about him at edwardiantaylor.com and follow him on Twitter, Instagram, and Tumblr @edwardiantaylor.